Bandwidth is precious. You paid for it. God help anyone who tries to steal it. The Karma hotspot flips this equation on its head. Share your connection, and both you and your leecher get 100MB of free data. It's enough to warm even the Scroogiest of hearts. Anyone with a Facebook account is free to tap into your bandwidth, free of charge. So theoretically, you could take your Karma around town, racking up gratis gigabytes like candy on Halloween. That's the idea, anyway. Should you run out of free data, you can always buy more for $14 per gigabyte, no contract required. 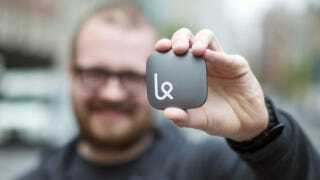 The device itself is a typical, pretty nice-looking mobile hotspot. When it launches, it'll cost $69, have 8 hours of battery life, and run off of Clearwire's 4G WiMax network. But your Karma account is independent of the physical device. This means you can log in and have access to your data reserves wherever anyone has a Karma hotspot, which might be a more common sighting than you would think—the company plans to team up with major partners (like American Airlines) to help gain the exposure needed to build a robust network of users.